Some say that the social era is eroding our interpersonal skills and deteriorating our sense of community; however, condo developers are reviving the novelty of neighbourhood living by tailoring their projects to suit the growing sharing economy among young buyers. A sharing economy allows residents to experience luxury in a new and innovative way, where they can call amenities their own, but only when they need them. Lighthouse Tower, the first phase of residential at Daniels Waterfront - City of the Arts in Toronto, will be giving residents access to a shared art studio, a jam studio and a kitchen library, among other useful amenities. This development is clearly directed towards young creatives and the features that they need may hint at future condo standards. These features are timely, considering the mentality that millennials have adopted in the digital age, where you can have what you want when you want it. With that, introducing the sharing concept makes for a stronger, closer-knit, less wasteful community. 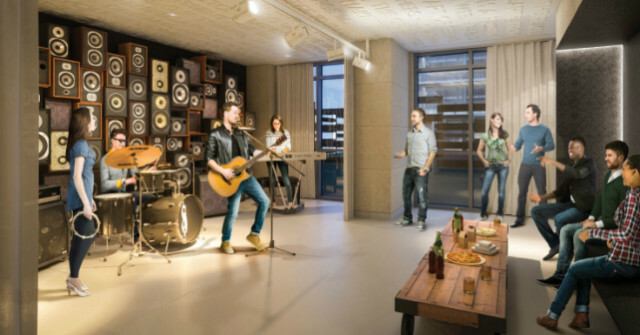 Noise restrictions can be stifling to musicians, so having a space to make and practice music will provide residents with a creative outlet that they would have otherwise sought elsewhere. Rental or rehearsal space for musicians in the city can cost a pretty penny, and it’s not always feasible when trying to make ends meet and pay off a mortgage. Sharing the space with neighbours is an added plus because the musicians at Lighthouse Tower can learn from and practice with fellow musicians and even collaborate. Without a doubt, musicians will end up sharing ideas and even instruments. Another standout amenity at Lighthouse Tower is the arts & crafts studio, which will provide artists with an in-house space to work and even develop their craft with workshops and classes. Again, artists living in the building will end up sharing ideas and perhaps even tools and other equipment and supplies. This amenity will also save the artist money on a monthly basis since most artists pay upwards of hundreds of dollars just to have a few square feet to set up a canvas. The art studio will allow artists to work, network and collaborate in a comfortable, creative environment, and help them save money! How often do you use your food processor? Most people tend to cycle through the same kitchen tools and only use the pricier, non-essential appliances on occasion, causing them to spend more time in the drawer than on the countertop. 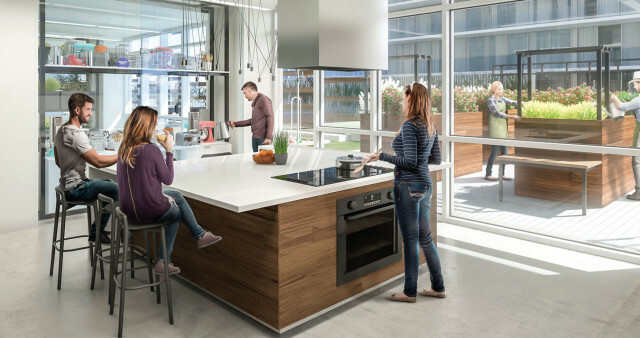 Thankfully Daniels’ Lighthouse Tower will feature a kitchen library, where residents can rent out kitchen tools, attend nutrition seminars and receive hands-on training from a chef. With condo unit sizes decreasing on average, storage is also becoming an issue for at-home chefs. There are simply too many appliances and equipment for a condo kitchen to store, so it makes sense to have them all in a place that doesn’t take up storage and you have access to them when you need them. In addition to the condo amenities, Artscape Launchpad will be built on the City of the Arts site. Upon graduating from art school, many artists find that their access to space and supplies is vastly restricted. With Launchpad, they hope to provide artists with all of the space and supplies that they need for up to $150 per month. It’s like a gym for artists. At Launchpad, artists will have a 30,000 square foot co-working space, decked out with valuable equipment and supplies. Still, it will be adhering to the sharing philosophy by giving artists access to pricey supplies. 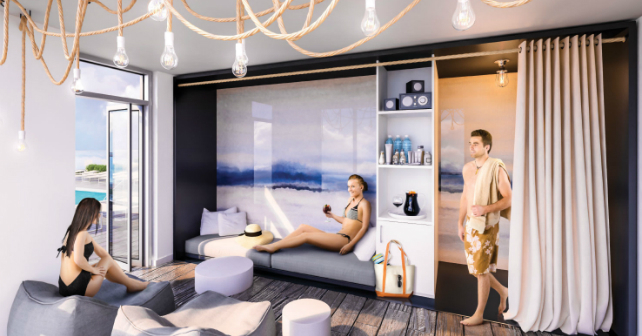 Lighthouse Tower is over 70% sold, so be sure to visit the website now to find out how you can call this artist-centric condo community home!